Opening Song: "Shake Your Sillies Out" by Raffi. Memory Box: This week's Memory Box item was a blue lizard from Roar: A Noisy Counting Book. I explained our theme, telling the kids that they say March "comes in like a lion, goes out like a lamb" because the weather is usually cold and fierce like a lion at the beginning of March, but by the end of March it's warm and gentle as a lamb. Book: Roar! 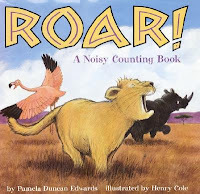 : A Noisy Counting Book by Pamela Duncan Edwards. 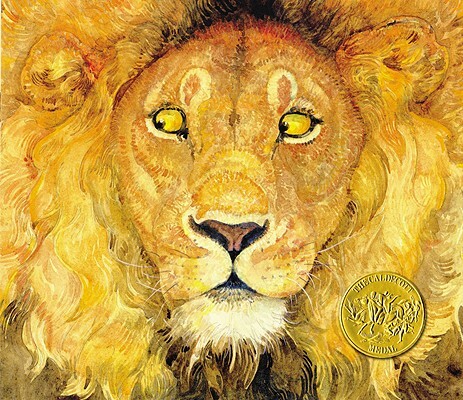 Not only does this book have great vocabulary (lots of African animals), but it gives kids an opportunity to be noisy and show off their roars! Since I have a pretty rowdy crowd, I only asked them to roar for me at the very end of the book. Walking through the jungle and what do I see? After everyone put their lions on, we counted them all. Book: The Lion and the Mouse by Jerry Pinkey. This Caldecott-winner is a gorgeous book and though I had never "read" a wordless book at storytime before, I knew I had to try it out. It went over pretty well and probably would have gone over better if I had practiced the story a bit more before I shared it. Then again, my group is pretty rowdy so it might have gone a bit smoother with a smaller or quieter crowd. Book: Where is the Green Sheep? by Mem Fox. This is one of my favorites for its sweet illustrations and gentle rhyming text. 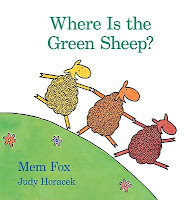 I had one kid in my group who said his favorite color was green and he was suitably delighted when we finally found the green sheep at the end of the book. Goodbye Song: Do You Know What Time It Is? We have a hand die for our die-cut machine, so we provided hand cutouts in yellow and orange but we let them know that if they wanted to trace their child's hand and use that for the mane instead, they could certainly do it! I overheard one grownup telling her child that if she wanted a different color they could trace her hand at home. In Like a Lion, Out Like a Lamb by Marion Dane Bauer. Mary Had a Little Lamb by Mary Ann Hoberman. Sheep in a Jeep by Nancy Shaw. That's Not My Lion by Fiona Watt.